The start of fall in the Northern Hemisphere begins Sept. 22, 2014. Sick of long, hot summer days? Well, you're in luck. Astronomically speaking, autumn is about to begin in the north. On Monday (Sept. 22), at 10:29 p.m. EDT (0229 Sept. 23 GMT) autumn begins astronomically in the Northern Hemisphere. This also marks the start of spring in the southern half of the globe. Referring to the equinox as being a time of equal day and night is a convenient oversimplification. For one thing, it treats night as simply the time the sun is beneath the horizon, and completely ignores twilight. If the sun were nothing more than a point of light in the sky, and if the Earth lacked an atmosphere, then at the time of an equinox, the sun would indeed spend one half of its path above the horizon and one half below. But in reality, atmospheric refraction raises the sun's disc by more than its own apparent diameter while it is rising or setting. Thus, when the sun looks like a reddish-orange ball just sitting on the horizon, it's really an optical illusion. It is actually completely below the horizon. In addition to refraction hastening sunrise and delaying sunset, there is another factor that makes daylight longer than night at an equinox: Sunrise and sunset are defined as the times when the first or last speck of the sun's upper or lower limbs — not the center of the disc — are visible above the horizon. And this is why if you check your newspaper's almanac or weather page on Monday and look up the times of local sunrise and sunset, you'll notice that the duration of daylight, or the amount of time from sunrise to sunset, still lasts a bit more than 12 hours. In New York City, for instance, sunrise is at 6:43 a.m., and sunset comes at 6:54 p.m. So the amount of daylight is not 12 hours, but rather 12 hours and 11 minutes. Not until Sept. 26 are the days and nights truly equal. (On Sept. 26, sunrise is at 6:47 a.m., and sunset is 12 hours later). At the North Pole, the sun currently is tracing out a 360-degree circle around the entire sky, appearing to skim just above the edge of the horizon. At the moment of this year's autumnal equinox, it should theoretically disappear completely from view, and yet its disc will still be hovering just above the horizon. Not until 52 hours and 10 minutes later will the last speck of the sun's upper limb finally drop completely out of sight. Certain astronomical myths die hard. One of these is that the entire Arctic region experiences six months of daylight and six months of darkness. Often, "night" is simply defined by the moment when the sun is beneath the horizon, as if twilight didn't exist. This fallacy is repeated in innumerable geography textbooks, as well as travel articles and guides. 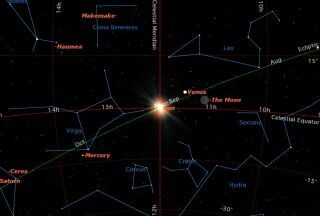 But twilight illuminates the sky to some extent whenever the sun's upper rim is less than 18 degrees below the horizon. This marks the limit of astronomical twilight, when the sky is indeed totally dark from horizon to horizon. There are two other types of twilight. Civil (bright) twilight exists when the sun is less than 6 degrees beneath the horizon. It is loosely defined as when most outdoor daytime activities can be continued. Some daily newspapers provide a time when you should turn on your car's headlights. That time usually corresponds to the end of civil twilight. So, even at the North Pole, while the sun disappears from view for six months beginning Sept. 25, to state that "total darkness" immediately sets in is hardly the case. In fact, civil twilight does not end there until Oct. 8. When the sun drops down to 12 degrees below the horizon, it marks the end of nautical twilight, when a sea horizon becomes difficult to discern. In fact, at the end of nautical twilight, most people will regard night as having begun. At the North Pole, nautical twilight does not end until Oct. 25. Finally, astronomical twilight — when the sky indeed becomes completely dark — ends Nov. 13. It then remains perpetually dark until Jan. 29, when the twilight cycles begin anew. So, at the North Pole, the duration of 24-hour darkness lasts almost 11 weeks, not six months.